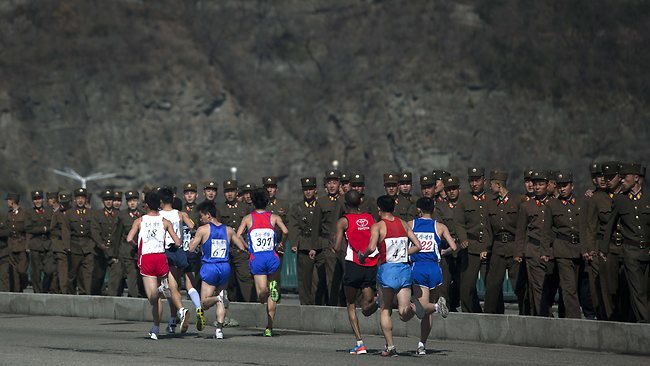 Many of the top athletes were on hand mingling with race officials from all over the world. One who wasn’t in attendance was marathon world record holder Patrick Makua of Kenya who remained holed up in his room at the Tower Hotel. Makau has publicly stated his fitness is at a high, high level, and coming after the disappointment of being named to the 2012 Kenyan Olympic team, then being told he wasn’t going to go, nobody has more motivation for Sunday’s race. But one just wonders with this much iron in the field whether hesitance and tactics might not trump pure speed, as we saw in Boston as well. The pace makers for Sunday have been assigned a 61:45 half-way goal. The women’s pacers are looking to hit 1:09:30. Earlier in the day after an organizing committee meeting, I sat down with London’s chief executive Nick Bitel, and asked if anything fundamental had changed due to the Boston bombings. 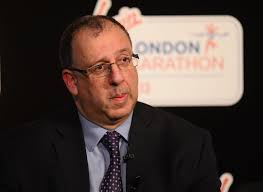 Nick Bitel, London Marathon Chief Exec. “London Marathon co-founders Chris Brasher and John Disley founded the race on six pillars,” Nick explained. “The first was to show that on one day at least humanity can be united. The only difference is in how quick or how slow. This year, that pillar is even more important than ever. Sporting events have been targeted by terrorists before. Nobody who was alive at the time can forget the tragedy of the 1972 Munich Olympics, or that Atlanta was targeted by a bomber in 1996 during their hosting of the Games. What is different now is that while the shock still registers, the response is immediate as the innocence has long since departed. Bitel said the event e-mailed every participant, and texted every volunteer leader. The whole strategy was to communicate, communicate, communicate. In fact, the opposite seems to be the direction the city is taking. As the legion of news accounts, books and stories coming out of World War Two can attest, there isn’t a more resilient people under fire than the Brits. Not surprising, perhaps, that we Yanks still retain some of that DNA.